Smooth coffee blend. Per 100ml 30 kcal. No funny business - Gluten, nut and dairy free. No preservatives. No colours. Vegan. Suitable for Vegetarians. Pick a Better Brew What goes into our Cold Brew? 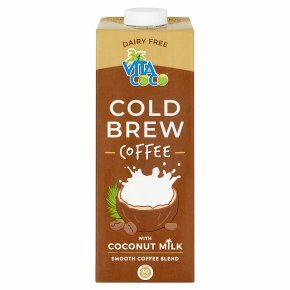 Well, it's simple (and plant-based): just cold brew coffee and coconut milk from Vita Coco. Delicious and Nutritious Our coconut milk has naturally occurring electrolytes and vital nutrients in every sip. New Coffee Recipe, Same Coffee Routine Coffee's never asked what time it is, and neither will we. Find us in the fridge for breakfast or an afternoon pick-me up. We'll perk you up! 40% Less Sugar That's right, 40% less than the market reference for coffee milks.